Good Morning, this is Capital Essence’s Market Outlook (the technical analysis of financial markets) for Thursday December 27, 2018. 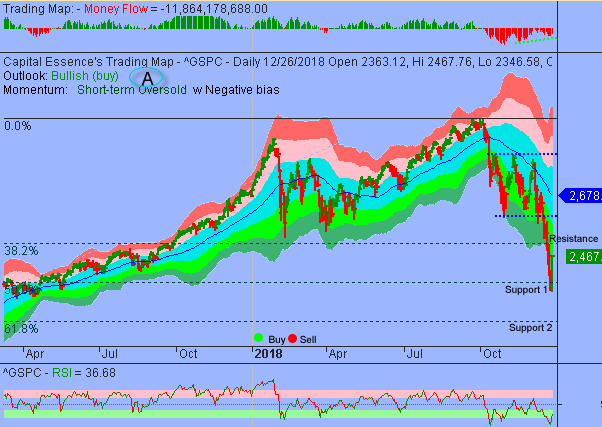 We’ve noted in the previous Market Outlook that: “Monday’s massive selloff had finally generate oversold conditions within the framework of the long-term uptrend. While there is a higher than average odds for a short-term rebound, we expect increase in near-term volatility as markets establishing a tradable low.” As anticipated, strong holiday sales and some short covering helped drive the S&P to its best one-day gain since March 2009. For the day, the bench mark gauge surged 4.96 percent to 2,467.70. The Dow Jones Industrial Average jumped 4.98 percent to 22,878.45t and the Nasdaq Composite soared 5.84 percent to 6,554.36. The CBOE Volatility Index (VIX), widely considered the best gauge of fear in the market, tumbled nearly 16 percent to 30.41. Amazon (AMZN) and retail stocks, in particular, led the market higher. Amazon announced a record-breaking holiday season, and MasterCard’s SpendingPulse report noted that holiday sales from November 1 through December 24 showed the strongest year-over-year growth rate since 2011, resulting in a new record for dollars spent. The SPDR S&P Retail ETF (XRT) rose 5.7percent on the day and is down 10 percent YTD, slightly underperformed the S&P. Now the question is whether the rally has more legs? Below is an update look at a trade in XRT. Our “U.S. Market Trading Map” painted XRT bars in red (sell) – see area ‘A’ in the chart. The first dominant feature on the chart is the rising trend line starting in 2009. The second dominant feature of the chart is the sideways trading range between 52 and 38 since 2015. Over the past few months, XRT has been trending lower in a short-term corrective mode after the 2017 rally ran out of steam just above the 2015 high. The August correction pushed the ETF down to the 38 zone. That level is significant in charting terms. It was tested several times over the past years and offered extraordinary buying opportunities to those whose can stomach the wild rides. XRT has resistance near 42. A close above that level will open up for a test of the 45-47 zone. 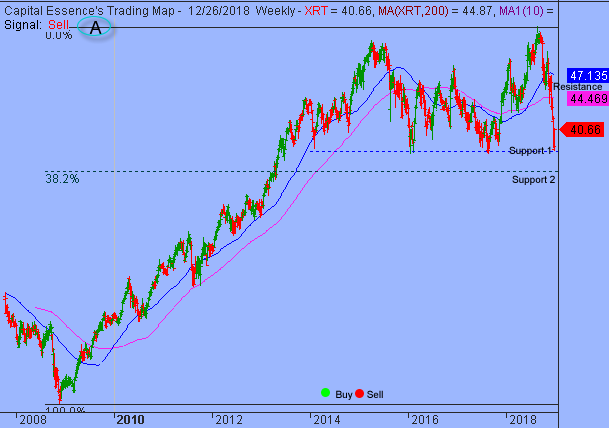 XRT has support near 38. Short-term traders could use that level as the logical level to measure risk against. A close below that level has measured move to 35, or 38.2% Fibonacci retracement of the 2009 major upswing. Short-term technical outlook shifted to bullish (buy). Last changed December 26, 2018 from bearish (sell) (see area ‘A’ in the chart). As expected, the S&P rebounded nicely off support near the 2340 zone. Wednesday’s rally pushed the index back above the lower boundary of its short-term trading range. Momentum indicator shifted higher from oversold zone, allowing additional upside probing. Money Flow measure trended higher from below the zero line, another sign that selling pressure has eased. As shown, a clear bullish divergence has been building between Money Flow measure and price. Money Flow measure printed a higher low as prices broke down in mid-December. This is a positive development, suggesting that an important near-term low has been established and the S&P is in an early stage of recovery rally. Nevertheless, given the damages done over the past weeks, there is a no reason to turn particularly bullish until the 2600 zone is eclipsed. On the downside, support is strong near the 2340-2320 zone. Although not expected this week, a close below 2320 on a monthly basis will break the multi-year bull trend and a much deeper decline should be expected. Short-term trading range: 2340 to 2530. S&P has a strong band of support near 2340. The index has resistance near 2500-2530. A close above 2530 could trigger acceleration toward the 2600 zone. Long-term trading range: 2320 to 2730. S&P has support near 2330. A close below that level on a monthly basis has measured move to 1920. The index has resistance near 2650. A close above that level has measured move to 2730. In summary, based upon recent trading action, an important near-term low had been established and the S&P index is in an early stage of a snap back bounce. Our near-term work on momentum and price structure suggested that the relief rally can be sustained for a few days, potentially allowing for a test of 2600 before a significant pullback unfolds.